Treat them right with the Rayne Nutrition S.I.T. (Single Ingredient Treats) line for your pet with sensitivities or allergies. Rayne Nutrition’s jerky treats are not only healthy and delicious, they can be given to both dogs and cats! 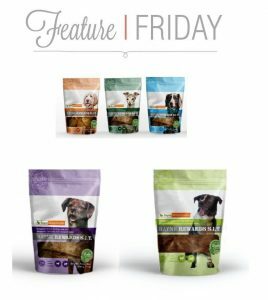 The protein source aligns with their diet offerings making it even easier to find the perfect treat for pets with sensitivities. They come in 4 different flavour options: newly introduced Kangaroo and Alligator join their current lineup of Pork and Rabbit (Turkey treats will join the family soon!). They also have a “cookie” treat with Pumpkin & Apple which is vegetarian. Rayne Nutrition Canada has dedicated themselves to developing nutritionally balanced diets for those hard to manage cases; pets that suffer from allergies that may have secondary conditions such as pancreatitis (which requires a low fat diet), or allergy pets who now have urinary issues. Rayne is in the unique position of being 100% Canadian owned and completely dedicated to the veterinary community. This allows them the freedom to design diets that veterinary team members need; multi-indication diets to keep pets happy and healthy, as well as take care of the most complex patients. They design diets not to compete with the current Veterinary Specific diets from other companies, but rather to create the diets that are needed in the special cases that we see. For more information on their diet selection check out their website.